Get our Florida ebook! 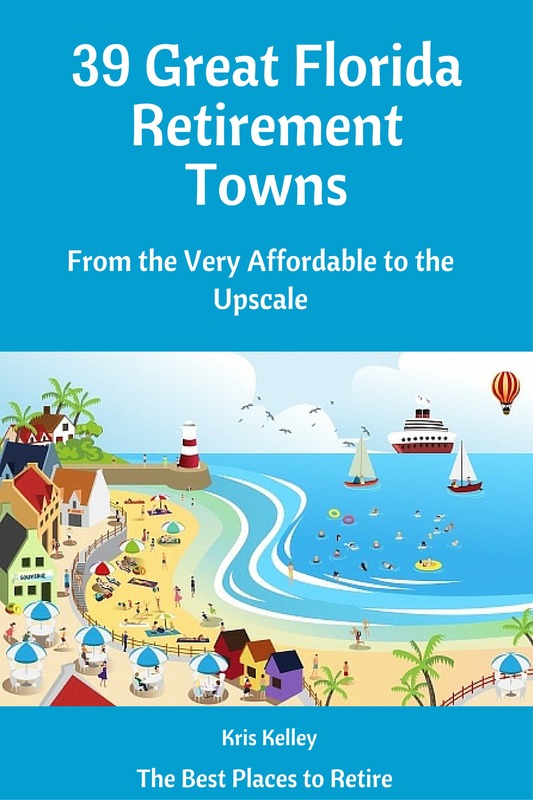 Reviews 39 great Florida retirement towns, from the very affordable to the upscale! Just $3.79 on Amazon! Sometimes called the Sixth Borough, stylish Boca Raton is known for its shopping venues, gated neighborhoods, pastel-colored buildings and lush parks. Wedged between the Intracoastal Waterway and the Atlantic Ocean, sleepy Briny Breezes is a mobile home park and an incorporated town with an oceanfront beach. Built by the Walt Disney Company, Celebration boasts tree-lined neighborhoods with New Urbanism architecture and white picket fences, a brightly-colored town center, a pretty waterfront and more. It is a great place to retire? Nestled amid lakes and named after a citrus titan, Doctor Phillips is a comfortable town with a good reputation. On a "Forgotten Coast," Eastpoint, a secluded little village, sits next to a state forest, across from a barrier island and close to pristine beaches. Quiet Edgewater is a waterfront town just north of the Mosquito Lagoon Aquatic Preserve and has a country quality. Tiny and remote, Everglades City is across from the northern end of the Ten Thousand Islands and is tucked against old growth cypress stands. The state has 1,040 golf courses, more than any other state in the Union. The 47 mile Pinellas Trail is the longest urban trail on the east coast. Orlando theme parks attract more visitors than any other theme parks in the U.S. The only place in the world where alligators and crocodiles co-exist is in National Everglades Park.